PW: check the guild info in-game! Step 1: Download Mumble! Install it, and open it up. Step 2: Click "Add New" at the bottom of the launcher. This should bring up a mini window to add in the server info. Step 3: Fill in the info as you see here! Step 4: You should see a ping and user count if you filled it in correctly. If you don't see that next to the "Battle Hardened" server, you need to go back to Step 2 and try again. 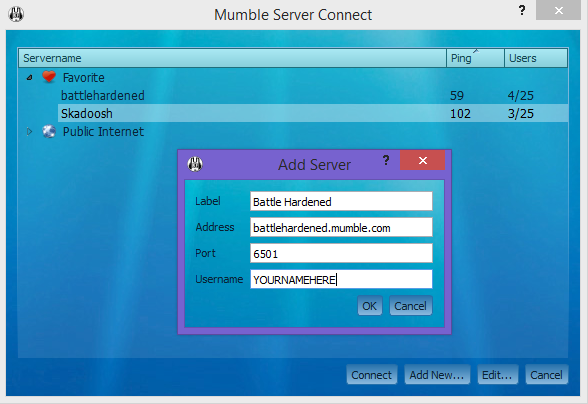 Step 5: Highlight the Battle Hardened server, and click "connect". Step 6: You will be prompted to put in a password. The password can be found in the guild info in-game! Step 7: Enjoy talking with your guildies!